On December 24, 1994, when four heavily armed terrorists from the Algerian Armed Islamic Group hijacked an Air France plane, Flight 8969, bound for Paris at Algiers' airport, the 227 passengers on board seemed destined for tragedy. After hours of tireless negotiations the plane was granted permission to leave only to head to Marseille for refueling. Avoiding politics and emphasizing only the events themselves (is this a good thing? 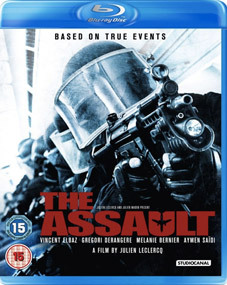 ), The Assault (L'assaut) weaves together the violent and claustrophobic onboard drama, with backstories of the tough SWAT officer and father Thierry (Vincent Elbaz), the determined jihadist from the slums of Algiers (Aymen Saidi), and an overly ambitious French Interior Ministry worker. Action-savvy director Julien Leclercq (Chrysalis) boldly returns with this taut, real-life thriller that culminates in an explosive gun-wielding standoff, which, at the time, aired live in front of an audience of 21 million television viewers. Leclercq seamlessly intertwines this harrowing real-life footage, heightening the stakes while driving home this heroic but foreboding event in French history. The Assault will be released on UK DVD and Blu-ray on 6th August 2012 by StudioCanal at the RRP of £15.99 for the DVD and £19.99 for the Blu-ray.